– For every top up between 20 CUC and 50 CUC, customers will receive an additional 50 CUC bonus to be applied to the promotional balance. – The promotion will run from Monday February 18th, 2019 00:01 Cuba time to Saturday February 23rd, 2019 23:59 Cuba time. – Promotional balance does not apply to email service, MMS or data from mobile phones, main balance will be deducted. 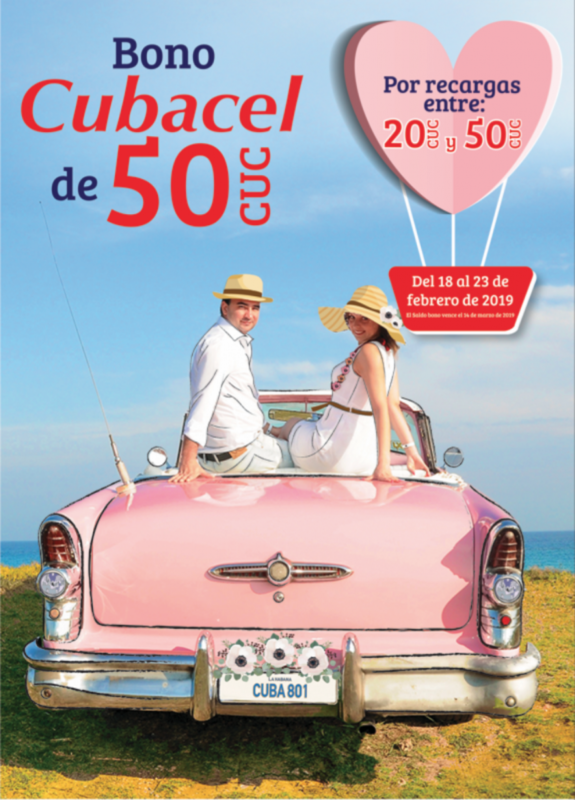 – The expiration date is not accumulative, the promotional balance will expire in March 14th, 2019 at 23:59 Cuba time. – Main balance will keep same validity as previous promotions (330 days from recharge date). – The balance transfer service is not available with promotional bonus, only main balance can be transferred. – If promotional amount is not enough to complete a call or to send a SMS, main balance will be deducted. – Customers will receive a SMS a few days before the expiration date of extra bonus. – Customers can check their balance via USSD ( *222*266#) for free. – Final price will not exceed $ 5.00 USD above the face value. Copyright © 2019 PREPAID UNION. Powered by WordPress. Theme: Accelerate by ThemeGrill.